The death of Steely Dan founder and guitarist Walter Becker put a question mark next to the future of the band. Could they continue without Becker, whose input was so integral? Should they even continue? The answer was yes, and yes. 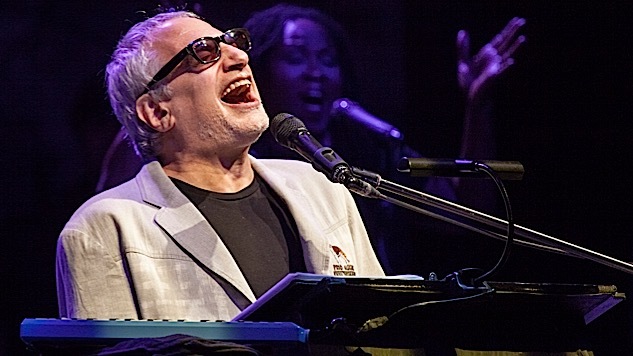 Donald Fagen confirmed he was committed to upcoming live dates and “keeping the music of Steely Dan alive”. The result was a memorable legacy performance at Bluesfest 2017. After The Doobie Brothers open the show, a band whose mark on classic rock is not insignificant either, the cavernous 02 in London is close to full. If you wanted to sing along, ‘Long Train Runnin’ and ‘Listen to the Music’ were your opportunity to do so. Steely Dan just aren’t that kind of band; their songs are mostly about crack and degeneracy. When Steely Dan take to the stage it is with such a minimal amount of fuss that we nearly miss it. Fagen ambles across stage, wearing a dark jacket and bright red trainers, raising a hand to the crowd before settling at the piano. If the entrance is typically laxodasical, the performance of opening song ‘Bodhisatva’ is characteristically intense. A brave song to keep in rotation this late in their career, the blistering beat and piano riffs announce a set full of classics. As Fagen gets older he comes to resemble his idol, Ray Charles, and sits at the piano with an impish gate. His banter with the crowd is minimal, but surprisingly colourful. Fagen seems happy to be on stage, a surprise in itself, and his bizarre tangents “We’ll play this next song…if we get permission…from the substitute teacher” are received with greater reverence than they probably deserve. It isn’t always a joke. “I gotta live with it” he sighs, as an empty mic stand signifies the place Becker would take. The death of Fagen’s old friend informs the performance, but does not weight it down. This feels like a celebration. Fagen misses enough notes that it is noticeable – other times he simply clips the line in half. He can be cut some slack – Dan lyrics are dense and wordy, but the limitations are visible to see. That said, the playing is the best we’ve seen all year. In particular touring drummer Keith Carlock is a joy to watch. While the precision of the recorded material isn’t quite there, the sheer force with which Carlock hammers his kit – seeming to punch the cymbals – is almost supernatural. The setlist is a little patchy – with a Joe Tex cover and a version of ‘The Untouchables’ – the highlight has to be Aja opener ‘Black Cow’, which is captured perfectly. The biggest surprise comes from ‘My Old School’ – a stiff song on record – which sounds full of life on stage. When you can improve a song you wrote in your twenties – you’re doing okay. Fagen remains snarky as ever. Everything about his stage presence suggests this performance is an elaborate practical joke. His ‘announcing’ each song (fans probably know the names after thirty years) and the endless in-jokes (with himself) speak to an unbaiting sense of mischief. Steely Dan may be a little creaky these days, but the snarl of Donald Fagen remains intact.